Shorouq Jabari is a physiotherapist at CVT Jordan. Hope is hidden within client stories, even when those stories are full of wounds. After surviving war and torture, clients’ lives have changed, and this really affects the whole family. But after clients go through the rehabilitative care cycle with CVT, I see change and hope. I see mothers helping their children after the trauma they’ve experienced. The children become comfortable with their mother again, and the mothers have told me they feel like mothers again to their children. The whole family is once again affected, but in a positive way. The work at CVT really affects the community and the family. One person healing works on the whole community. Helping communities as well as individuals has always been important to me. I knew of CVT’s work from courses I’d taken that featured CVT’s work with group counseling. I could see that CVT had a very good mix of working with a lot of people who need help, which fit well with my desire to do charity or volunteer work together with physiotherapy. CVT was the first place that I found in Jordan that had this mix of opportunities for my skills. I started my career doing traditional physiotherapy, so when I began working at CVT, I had a question at first: why do we need to read about psychology when we are physiotherapists? CVT creates a subspecialty within physiotherapy – at CVT you include mental health into physiotherapy itself. 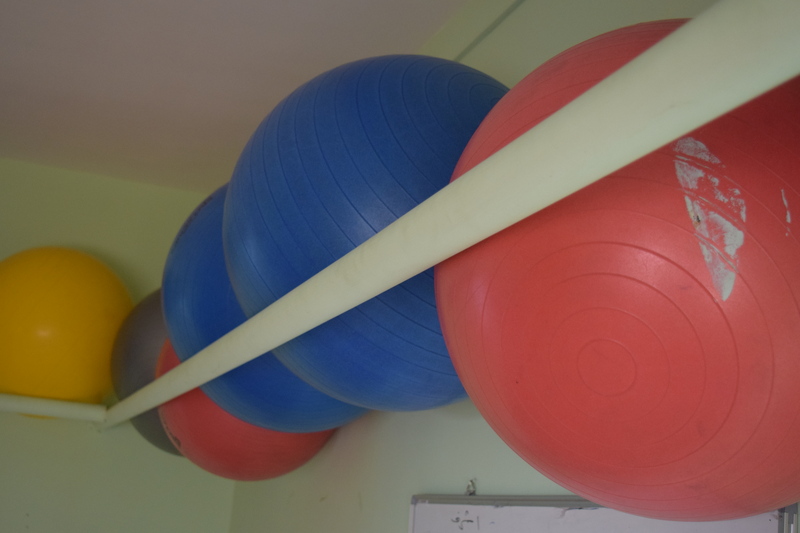 When the counselors do their intake, as physiotherapists we assess the physical side and begin looking to connect the body-mind part for clients. We create a treatment plan, which can include ten group sessions or customized sessions in an individual setting. The plan reflects the best access to psychological care and physical care as well as the clients’ other needs – the social part. My work is challenging; working with survivors of torture is complex. Often they can’t identify their pain as there is a disconnection between their body and their mind. They are sometimes unaware of what’s going on around them or what’s going on with them physically. It’s very challenging. In my past work unrelated to torture, clients were more straightforward in identifying their needs, and they knew why they had pain. They could localize it. “It’s in my back,” he or she would say, or “I have pain in my shoulders.” They were aware of the pain they were experiencing and the functional difficulties they had as result. With a survivor of torture, it’s different. He or she cannot localize the pain. Survivors often speak of general body pain, weakness and tension. It’s very important to identify the pain in order to treat it effectively. As an example, a typical client may be unable to walk, have difficulty maintaining balance and be unable to sleep. Clients have difficulty with this and may even have suicidal thoughts. We work on relaxation in the first two group sessions. If I’m working with a client who is unable to relax, we practice mindful breathing. Some clients tell me they have difficulty sleeping – they might clench their teeth hard and grip their hands, causing them to lose sleep and create tense muscles. After physiotherapy sessions, clients are able to sleep relaxed and comfortable. When your sleep is affected, it affects your whole day. To help survivors rebuild their lives, it’s important that they are able to wake up and do things in the morning, to feel comfortable when they spend time with their families. I like to provide relaxation techniques that clients can do on their own, anytime they want to. Some clients do relaxation with their families. Clients often understand their pain better as a result of education and exercises and tell me that one of the most effective treatments is the pain education. Clients often avoid everything in life because of pain; I’ve had clients who were afraid to move because of their pain. After physiotherapy sessions, I see clients who are able to run normally and jump over obstacles. I have seen them become more productive in their families, even play sports. Seeing this kind of improvement refreshes your soul. Positive outcomes and change in function are very typical of our clients; they are able to support their families better. When clients are able to do more and feel better, I find this is very rewarding. Rewarding work is important to me. The reason I have always wanted to do work for people who really need help is that I am counted as a refugee, from Palestine. I was born in Jordan, but my mother and father were refugees who came here. I see my community having the same challenges as the refugee communities of our clients from Syria and Iraq. Having my father as a refugee has taught me a lot – I know what he feels as a refugee. Since I was age 14 or 15, I wanted to volunteer. Something inside me told me to do this, to care for others who need it. My parents said to me, “You have to start with yourself. Build yourself to build not only yourself, but your country.” So I have always tried to take time from my day to help others.